Sightseeing, information and photographs - Ko Lanta island - Krabi - Thailand. Many of the local people work in fishing communities, and you can easily spot large groups of the colourful long-tail boats moored on almost every beach. Further inland, you can see rubber and palm farming set against the back drop of Ko Lanta's mountain range. On the East coast flat lands prawn farming and fish farming using floating baskets. Nearby, many small limestone islands offer a chance to peek into an amazing underwater world and neighbouring national parks boast hot springs and crystal pools. Ko Lanta Yai is a long thin island running North through South. The West coast (or sunset coast) faces the Andaman Sea with a string of beautiful white-sand beaches that host the islands' resorts. About halfway down the island the paved road turns from the West and crosses the mountains to the East coast. This beautiful drive takes you through rice paddies, rubber tree plantations and jungle, as well as passing through a number of small Muslim villages. The right-hand turning found opposite the small mosque in the little village just after the local school leads to Mai Keow Caves, and is signposted for tourists. Just before dropping to the eastern plateau, the road sweeps around a bend to a scenic site with a spectacular view of the sea between Ko Lanta and the mainland. Scattered with tiny tropical islands set against the backdrop of Krabi mainland, the outlook, particularly at sunset, is simply stunning. Binoculars can be borrowed from the restaurant if you stop for a soft drink or a meal. Colourful local fishing boats can be viewed close-up on many of the beaches. See them in large groups at the southern end of Klong Dao Beach, or next to the paved road between Klong Kong Beach and the National Park turnoff. The east coast is less developed and offers glimpses of life before tourism. It faces the mainland and has a coastline largely consisting of mangroves with some yellow-sand beaches in the South. Follow the main road south towards Ko Lanta Village and en route you’ll see rice paddies and prawn farms. Take the left turnoff to beautiful old Ko Lanta Village when you reach the main Police Station (on the right); continue on and you’ll pass the Buddhist Temple and the hospital before coming to the Sea Gypsy Village. The Sea Gypsy Village at the southern end of the East coast offers a peek into the life of these ancient people, many who continue to live a nomadic existence on the sea. The village consists of small houses where people live private lives, therefore please respect their privacy and be sensitive about where you point your camera. If you’re lucky you’ll see the unique fishing cages used here, rigid constructions of about 1x2x3 metres with an entrance gate. They are taken out to places where tides concentrate fish, swum down to the ocean bottom, and tied to rocks to keep them from being swept away (all without the aid of diving equipment!). Follow the small stream on an enjoyable, relaxed walk through the jungle to the waterfall near Klong Jark beach, in the south. It reduces to a small shower in the dry season, but the fresh water pool below remains a great place for a cool dip. The terrain is easy-going and the route takes about 45 minutes. Guides can be hired for a small fee at the café where the road fords the stream. Continue your walk back past the road and follow the stream to Klong Jark beach – one of Ko Lanta’s prettiest small beaches. For an escape from the sun, take a hike to the popular Mai Keow Caves. Turn right off the paved road just after the mosque, and continue ‘til you see the parking place. A guide from the family owning the land will walk you up through the rubber tree plantation and jungle, over rope bridges to the cave entrance.For an escape from the sun, take a hike to the popular Mai Keow Caves. Turn right off the paved road just after the mosque, and continue ‘til you see the parking place. A guide from the family owning the land will walk you up through the rubber tree plantation and jungle, over rope bridges to the cave entrance. The caves consist of a series of spectacular chambers with rock stalagmites, stalactites and rock formations. It involves some climbing up and down on rope ladders but is not overly strenuous. When you spot people with muddy clothes and big smiles, they’re just back from the caves! Another choice for an underground adventure is the more recently discovered Tiger Cave. Find it off the national park road, just to the left. The Ko Lanta National Marine Park is at the southern tip of the island at t he end of a spectacular coastal drive. The park offers picnic areas with toilets & showers, a picture-postcard beach, and an interesting one-hour walk through unspoiled jungle, starting at the Park’s Headquarters. A small lighthouse on the southern point is popular for panoramic shots of the coastline. Take your own food for picnics; cold drinks are usually available on site. Ko Lanta has one paved road running from Ban Saladan (the main town) along the length of the West coast, then turning across the island and following the East coast southwards. The unpaved roads are generally in pretty good condition, but can deteriorate quickly in rainy season, becoming more difficult to negotiate without a 4 wheel drive. The main form of transport on the island is small motorcycle or scooter. These can be rented by the day, week or month at any resort or travel agency - you can expect to pay around B250 per day plus petrol. Even though there is little traffic, please keep to the left, drive with care and go slowly enough to enjoy the views! Many visitors return home with a “Thai tattoo” on their leg – a small scar left by the burn mark from a motorcycle exhaust – remember they get hot! If you have a flat tire, you'll probably find a small 'patch tire' shop nearby that will fix it quickly and cheaply. A safer way to explore the island, particularly for families, is by Jeep. Small Jeeps area available for rent by the day or week through most travel agents on the island. Booking in advance is recommended as there is a limited supply of jeeps on the island. A limited Song-Thiew service is in operation, offering cheap transport available along the main road, in the back of pick-ups fitted with canopies & benches. 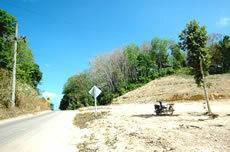 Motorcycle taxis and tuk-tuks can be hired easily in Ban Saladan and along the West coast of the island. Resort transport runs from most resorts to the Pier in Ban Saladan, meeting the ferry and minibus arrivals & departures daily, at 8 am, midday and late afternoon.